Singapore. The group’s operational and investment holding activities spreads across Singapore, Malaysia, Thailand, Philippines, Indonesia, UAE and China. The business principles of Founder Chairman ENG LIAT KIANG which are Thrift, Diligence and Integrity remain as core values of the Sin Heng Chan Group. Sin Heng Chan’s mission is to perpetuate a strong and steadfast entity through its operational and investment holding activities; so as to provide value in its goods and services to its customers; giving long term employment to well deserving employees and serving society at large; in the creation of wealth for the company as well as its shareholders. The group’s core businesses are in general trading in Rice and Sugar; Feedmilling; Cement and Concrete operations, Property development and other Investment holding activities. The rice and sugar division operates from a large warehouse in Jurong which is owned and operated by the group with a fleet of trucks to meet the needs of its customers. developing nation. Realizing the need for scientifically formulated feeds for both poultry and other animals to meet the growing demand for meat and eggs, the company’s rice milling operations were converted and later expanded to Malaysia, Indonesia and Philippines. 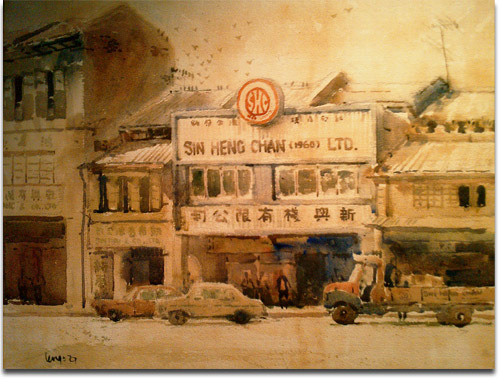 In 1973 Sin Heng Chan (Malaya) Bhd was listed on the Singapore and Malaysia Stock Exchange and went on to expand its feedmilling activities to a fully integrated agricultural unit which included feedmills, breeding, broiler growout and layer farms poultry processing plants and livestock farms. In 1993, the group divested Sin Heng Chan (Malaya) Bhd at the peak of the Malaysian stock market, which valued the company at more than Malaysia Ringgit 240 million. The group presently retains its feedmilling interest in Indonesia and the Philippines, providing quality feeds for poultry, livestock and aquatic animals as well other farming activities. The group’s cement terminal activities are carried out through Sin Heng Chan (Singapore) Pte Ltd. The terminal which sits on prime water front land, in Jurong port has a storage capacity of 60,000 tons and operates its own 800 ton/hour SIWERTEL unloader. The terminal is installed with fully automated and computerized unloading and despatch facilities, serving the needs of the concrete industry and have handled millions of tons of cement since 1997. The group also has a joint venture export cement terminal in Jintang Port with the Hebei Jidong Cement Corporation, PROC. Sin Heng Chan’s concrete interest in Singapore, is held in Alliance Concrete Singapore Pte Ltd in joint venture with Lafarge Cement and Asia Cement Corporation. It is one of the largest concrete companies in Singapore having supplied major government projects and well as concrete demands of the private sector. Sin Heng Chan also operates a ready mix plant in RAK, United Arab Emirates in joint venture with Robodh Contracting Co LLC and two other ready mix plants in Chongqing and Mianyang, Sichuan, PROC. These are all twin mixer stations with state of the art mixing and batching equipment and a fleet of company owned GPS trucks and pump trucks. government contracts, iconic projects as well as to the burgeoning property market in China. The Properties Division of the group focuses mainly on boutique residential projects. It has undertaken a number of award-winning projects in Singapore such as Gilstead Brooks strata-houses, NOMU apartments and bungalows at Victoria Park Road. It has also undertaken several well-regarded strata housing projects such as Watten Residences and Barker Terraces as well as a number of exclusive bungalows around Singapore. As such, the Sin Heng Chan Group has gained a reputation for the design and quality of its developments. Sin Heng Chan has been involved in property development since the 1980s. Property development in Malaysia was then carried out through Eng Development Co Sdn Bhd. Sin Heng Chan has also carried out property investments throughout the region, in Malaysia, Thailand, Indonesia and China. Sin Heng Chan continues to expand its property business with projects in Singapore, Malaysia and Indonesia with an emphasis on unique design, attention to detail and quality finishes. The Sin Heng Chan group is owned and controlled by the Eng family. Mr Eng Liat Kiang who migrated from Shantou to Singapore in 1936 remains as Chairman. Mr Eng Bak Chim, a Business Studies graduate from England is the Managing Director of the group operating subsidiaries. Group finance is managed by Executive Director Mr Heng Gek Hwah, a Chartered Accountant by training. Group activities are conducted through a line of experienced and professionally trained managers; many of whom are long service members. Total staff strength of the group number approximately 500 persons. Our main bankers are United Overseas Bank Ltd and Oversea-Chinese Banking Corporation Ltd with whom Sin Heng Chan have had long standing and established relationship with.